As you travel up this stunning Big Island mountain in luxury vans, learn fascinating facts about island geology and natural history from your guide. Stop first at the Onizuka Visitor's Center to find out why the world's largest telescopes are located here. Then get ready for the steep half hour ascent to the summit. Check out the observatories and watch an enchanting sunset followed by stargazing! Enjoy hot drinks during the "Star Party" as guides interpret the stunning night sky in a way that everyone can enjoy. This mountain is one of the only places on earth where you can drive from sea level up to the towering height of 14,000 feet in about two hours. Temperatures can sometimes even drop to chilling freezing temperatures of 32 degrees Fahrenheit (0 degrees Celsius), and it is one of the two locations in Hawaii where it can snow, with the other being the sister mountain of Mauna Loa. For other details about Mauna Kea tours, or what to expect during Mauna Kea adventures, jump to our FAQ section. To hear what others are saying, jump to our Mauna Kea stargazing reviews page. An incredible tour that you will not soon forget! Enjoy a delightful evening with a delicious dinner as well! Dinner Menu: Enjoy a hearty hot supper of Veggie and Cheese Lasagna, a tasty chocolate brownie, and gourmet hot beverages. Please note: If you have a group of 8 people or more, please call us at 808-690-9990 to make your booking. If you have a group of 8 people or more, please call us at 808-690-9990 to make your booking. Please note: This package does not include meal. Before sunset, enjoy a hearty meal at the Mauna Kea Visitor Center. Here you'll be in view of the observatory's massive telescopes, where astronomers are hard at work probing new details about our universe. Watch a beautiful sunset from one of the clearest skies in the world! Unobstructed views for miles in every direction make this one of our favorite things to do on Big Island. After sunset, stick around for hot drinks and stargazing with a powerful telescope. Mauna Kea's elevation and distance from civilization give it two advantages: hardly any light pollution and crystal clarity for star viewing. Pick-up times will vary from day to day depending on the location of the pick-up of and sunset times. 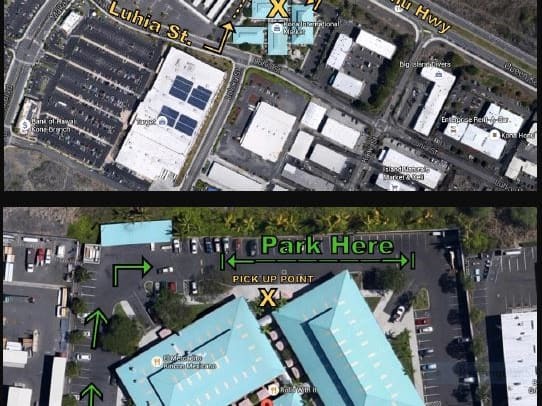 Kona International Marketplace: Please park away from the shops to be courteous to customers shopping at the center (see the image in the inset). The pick-up point is at the rear parking lot. There are restrooms at the marketplace and parking is free. If you are coming via taxi, be sure to arrange a taxi for your return trip ahead of time. The tour returns late in the evening, and taxi service may not be available without prior arrangements. Queens Marketplace: Please park on the back (south) side of the mall. The pick-up is directly in front of the Starbucks Coffee store. Junction of Hwys 190 & 200: Park across the street from the big green "Saddle Road" sign as seen when traveling from Waimea. There is a cleared, gravel area in which to park. Please do not leave valuables in your car. Return times will vary depending on the time of sunset and the drop-off location. Participants may not scuba dive within 24 hours of this activity due to the risk of decompression sickness. Persons who are obese (Body Mass Index of 40 or over) should not make this trip. Participants with any history of a respiratory problems (this includes pneumonia in the last 6 months, any lung conditions or surgeries) are not permitted to take this tour. Contact your physician if you have questions about traveling to this altitude. Participants with any history of heart problems (this includes ANY heart surgery, stent, pacemaker, heart valve irregularities etc.) are not permitted to take this tour. Contact your physician if you have questions about traveling to this altitude. Wheelchair Accessibility: Tour vehicle is not equipped with a lift. Must be able to get into the van with assistance, storage available for collapsible wheelchairs. Please indicate during booking for most convenient arrangements. The average temperature on top of Mauna Kea is 30°F and wind is common. Please wear long pants and closed toed shoes and bring any layering garments you may have. Road closures due to high winds near the summit may happen in the winter. If a road closure is discovered en route a shorter version of the tour will continue and guests will receive an $80 refund per person. If a road closure is discovered before departure, guests will be contacted and given the option to cancel at no charge or receive the $80 refund per person and still participate on an shorter tour. If you cannot be reached, your booking will be canceled and you will be given a full refund. Beverages & snacks are available for purchase at Mauna Kea Visitor Center, but you are welcome to bring your own beverages if you want (no alcohol). You will see lots of pasture, volcanic, and forest land on the way up to the summit, with a stop for some epic island views from 9200' above sea level. You will also get to watch the sunset over volcanic mountain tops and star gaze under the open sky and through telescopes. No, these are not available even for human viewing since they are digitized and physically huge. The tour operates outside of the observatory public hours so you do not visit the observatory. Sometimes you get to see them open their domes and set the telescopes. Mauna Kea has 40% less oxygen than sea level and 40% less air pressure than sea level. This lack of vital oxygen can be a very serious problem for persons with heart or lung disease. Built for comfort, the 14 passenger 4v4 Van Terra micro-coaches are equipped with air conditioning, stereo sound, PA, phone, first aid and oxygen, parkas, and a telescope. Each van can hold up to 14 people. Will we be guaranteed to see stars? Mauna Kea enjoys an average of 325 clear nights per year. Most of the inclement nights are easily predictable. The weather is monitored on a daily basis and if poor scenic conditions are likely, the trip will be cancelled and a full refund given (or reschedule if available). Like any high mountain there can be unpredictable and fast changing weather at any time. A hearty hot supper of 3-Cheese Vegetable Lasagna with a tasty homemade chocolate brownie (the brownie may have nuts). Gourmet hot cocoa, coffee and tea accompanied with biscotti while stargazing. Ingredients in the lasagna may vary from day to day based on local availability and the season of the year. Includes fresh lasagna pasta tomato sauce with herbs, cottage cheese, Parmesan cheese, mozzarella cheese, asiago cheese, garlic, onion, corn, spinach, broccoli, carrots, sun-dried tomatoes, squash, mushrooms and more. Unfortunately, there is no alternate for dinner, if you would not like dinner or do not want this option, please contact us at anytime. Your guides will provide you with new Celestron CPC 1100 telescopes that are equipped with Starbright XL coatings for 10% more light throughput than ordinary instruments. These scopes are computer automated and have spectacular optics. Because they are bigger and have better optics they gather about 100% more light than telescopes used on other tours. What jackets sizes are available? Is there a shuttle in Waikoloa that stops at the Queen's Marketplace? Yes, there is a shuttle that provides transport within Waikoloa Beach Resort with a stop at Queen's Marketplace. The pick-up locations include the Waikoloa Beach Marriott and the lower lobby of the Hilton Waikoloa Village. It operates daily from 10 am to 10 pm and runs every 15 minutes. The shuttle currently costs approximately $2 each way. Will volcanic activity from Kilauea Volcano affect visibility? Most likely, no. Visibility is rarely affected by the volcano, as Mauna Kea's summit is approximately 10,000 feet above sea level, beyond even the veil of most low-lying clouds.